On a muggy August morning in 2012, school buses full of teachers, janitors, cooks and other workers converged on the Ellis Davis Field House, a blocky modern building named for a beloved basketball coach and teacher who spent more than two decades at Dallas’ Roosevelt High School. 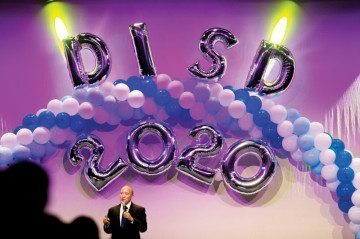 They’d been summoned to meet a man who promised to change everything, to make the Dallas Independent School District (DISD) the best in the country. Miles had designed the show as his grand debut in front of his new school district, and he’d summoned his new employees to bear witness. Miles had already been on the job more than a month, and new data released in summer 2012 showed Dallas’ school district wasn’t exactly in need of saving. On his first day as superintendent in July, Miles announced encouraging news: Since 2007, the graduation rate had risen 15 points, up to 77 percent. Dallas ISD’s test scores had improved over the previous eight years, outpacing the average improvement around the state. But many of its schools were still struggling mightily, and plans to reform the curriculum had stalled under sharp budget cuts. Miles arrived with a bold promise: He’d transform Dallas into the country’s No. 1 urban school district in just eight years, with 90 percent of its students graduating on time, and 60 percent reaching college-ready scores on their SATs and ACTs. The Texas Observer. 11 Nov. 2014. Web. 09 July 2014.